The Nicaragua Education Culture and Arts Trust (NECAT) is a UK registered charity supporting educational initiatives in Nicaragua through sponsorship of after-school clubs and other educational projects that operate through the medium of culture and the arts. To help overcome the lack of educational opportunities for children from modest backgrounds in Nicaragua NECAT has opened a Learning Re-inforcement Centre in the indigenous barrio of Sutiaba in the city of León. By running this centre for underprivileged children we are able to have a base that can act as a model centre for extra mural education. 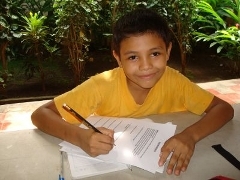 The centre is run by qualified teachers and supported by Nicaraguan, UK, US and European volunteers. In our work we focus on affectivity, working with small groups of children and prioritising the needs of the individual child. The children come along every weekday afternoon, receiving support with their schoolwork and enjoying other educational activities (such as painting or reading) for which there is no time or money in the school curriculum. Using grant funding we are able to reach out to other communities from our base in Sutiaba. Through our bursaries, nutrition and mobile library programmes we are able to help children achieve their educational aims. ﻿﻿To gather resources both human and financial in the UK and elsewhere that can be applied to the benefit of childrens’ education on the Pacific Coast of Nicaragua and to developing their potential through cultural and artistic projects. Our vision is of a Nicaragua where all children have an opportunity to achieve their potential through an education system supportive of the national culture and values.